We have mentioned before the definitive text for genealogists on the citing sources, Evidence Explained, by Elizabeth Shown Mills, when we proposed a way to identify locations with certainty using the codes assigned by the French department of statistics, the INSEE. No one can disupte the excellence of the methodology in Evidence Explained; but there are some difficulties for those working with original French sources. Shown Mills quite naturally assumes that most of her readers will be working with microfilms of French actes d'état civil in their local Family History Library and so, gives examples for how to cite the source in terms of FHL codes, which is of little help when one is working with the original or with other types of documents not filmed or in the FHL. 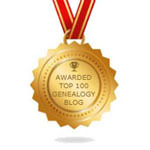 Just now, Sophie Boudarel, on her blog La Gazette des Ancêtres, is running a series of posts explaining how sourcing is done by French genealogists. It is extremely useful and we cannot improve upon it, but recommend it sincerely. She began with a post on how to organise one's genealogy files and notes, entitled Comment organiser ses dossiers généalogiques? In this, she discusses the SOSA system and quotes the noted genealogist, Jordi Navarro, who arranges his documentation not by individuals, but geographically. Ms. Boudarel then discusses how to cite and organise specific documents in Comment nommer ses documents en généalogie? She proposes a system quite different from that used by most Anglophone genealogists. In the following post, Comment utiliser les sources en généalogie? she again refers to Navarro, who had commented on her previous posts. A key difference that he makes is between a source document, such as a civil register, and the contents of a page within it, such as an acte de naissance. Whether or not one agrees with the system, we strongly recommend that anyone serious about French genealogy read these posts and others. Only by doing so will one be able to understand the French thinking behind the creation and arrangment of their own documentation. It will greatly aid researchers in finding what they seek, and in correctly identifying it afterward.